The concept of evidence based medicine (EBM), defined as the “integration of best research evidence with clinical expertise and patient values”,1 has been gaining popularity in the past decade. The practice of EBM involves a process of lifelong self directed learning in which caring for patients creates the need for important information about clinical and other health care issues. EBM recognises that the research literature is constantly changing.2 What the evidence points to as the best method of practice today may change next month or next year. The task of staying current, although never easy, is made much simpler by incorporating the tools of EBM such as the ability to track down and critically appraise evidence, and incorporate it into everyday clinical practice. The work of people in the field of paediatrics and child health centres on the problems of children and their families and carers. Questions about diagnosis, prognosis, and treatment often arise and sometimes the answers to these questions need to be sought. EBM allows the integration of good quality published evidence with clinical expertise and the opinions and values of the patients and their families or carers. Deciding on how to treat patients should not be based solely on the available evidence. Other factors such as personal experience, judgement, skills, and more importantly patient values and preferences must be considered. The practice of EBM should therefore aim to deliver optimal patient care through the integration of current best evidence and patient preferences, and should also incorporate expertise in performing clinical history and physical examination. 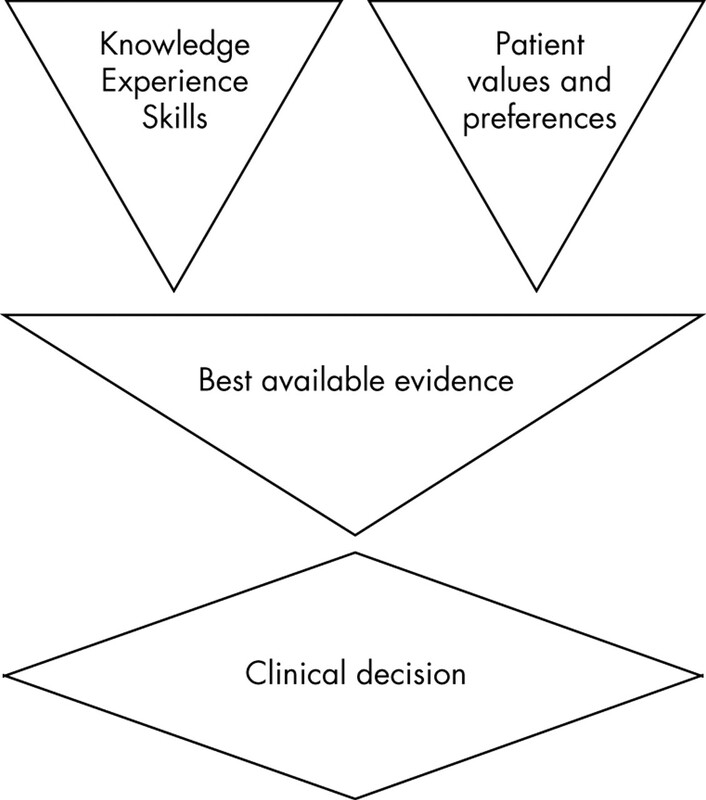 Figure 1 illustrates a typical flow chart of EBM, depicting how knowledge and experience may be integrated with patients’ preferences and available evidence in the making of clinical decisions. The most important reason for practising EBM is to improve quality of care through the identification and promotion of practices that work, and the elimination of those that are ineffective or harmful.4 EBM promotes critical thinking. It demands that the effectiveness of clinical interventions, the accuracy and precision of diagnostic tests, and the power of prognostic markers should be scrutinised and their usefulness proven. It requires clinicians to be open minded and look for and try new methods that are scientifically proven to be effective and to discard methods shown to be ineffective or harmful. It is important that health care professionals develop key EBM skills including the ability to find, critically appraise, and incorporate sound scientific evidence into their own practice. The practice of EBM involves five essential steps3,5: first, converting information needs into answerable questions; second, finding the best evidence with which to answer the questions; third, critically appraising the evidence for its validity and usefulness; fourth, applying the results of the appraisal into clinical practice; and fifth, evaluating performance. the outcome, or outcomes, of interest. Thus an answerable clinical question should be structured in the PICO (Patient or Problem,Intervention,Comparison,Outcome/s) or PIO (Patient or Problem,Intervention,Outcome/s) format. Patient or problem: 4 month old baby with viral bronchiolitis. Outcomes: clinical score, length of hospital stay. A four part clinical question may be formulated as follows: In a 4 month old baby with viral bronchiolitis, does the administration of corticosteroids compared with not giving corticosteroids improve clinical score and reduce length of hospital stay? Once you have formulated your clinical question, the next step is to seek relevant evidence that will help you answer the question. There are several sources of information that may be of help. Traditional sources of information such as textbooks and journals are often too disorganised or out of date.8 You may resort to asking colleagues or “experts” but the quality of information obtained from this source is variable. Secondary sources of reliable summarised evidence which may help provide quick evidence based answers to specific clinical questions include Archimedes (http://adc.bmjjournals.com/cgi/collection/archimedes),Clinical Evidence (http://www.clinicalevidence.com/ceweb/conditions/index.jsp), and BestBets (http://www.bestbets.org/index.html). Other important sources of evidence include the online electronic bibliographic databases, which allow thousands of articles to be searched in a relatively short period of time in an increasing number of journals. The ability to search these databases effectively is an important aspect of EBM. Effective searches aim to maximise the potential of retrieving relevant articles within the shortest possible time. Studies have shown that, even in countries where hospitals have facilities for internet access allowing health care personnel access to a number of electronic databases, many people are not familiar with the process of carrying out efficient searches and often conduct searches which result in too few or too many articles.9,10 It is therefore important for health care professionals to undergo basic training in search skills, either through their local library services or through the attendance at formal courses. The key to successful searching is to convert your clinical problem into a clear answerable question, which should ideally be framed in the PICO/PIO format as discussed above. Numerous online databases are available. These include the Cochrane Library databases, MEDLINE, EMBASE, and CINAHL. In day to day clinical practice, I will suggest that becoming familiar with one or two databases will suffice in most cases. I recommend the Cochrane Library databases and MEDLINE. The Cochrane Library databases—which include the Cochrane database of systematic reviews, the Database of abstracts of reviews of effectiveness, and the Cochrane controlled trials register—is maintained by the Cochrane collaboration, an international initiative which began in the early 1990s and was designed to prepare, maintain, and disseminate systematic reviews of health care interventions.3 The Cochrane Library is updated quarterly and is available through the internet or CD-rom. There is usually a charge for using the library, although NHS staff in the United Kingdom have free access to the service through the National Electronic Library for Health. MEDLINE is probably the most widely used database for searching the biomedical literature.3 It is maintained by the National Library of Medicine, USA. A version of MEDLINE (PUBMED) is freely available on the internet, is updated regularly, and is relatively user friendly. When looking for articles on effectiveness of interventions or treatments, the first point of call should probably be the Cochrane database of systematic reviews or the other secondary sources mentioned above such as Archimedes, Clinical Evidence, and BestBets. The Cochrane controlled trials register provides an index of published randomised controlled trials. Randomised controlled trials and systematic reviews may also be searched for using MEDLINE. SUMsearch (http://sumsearch.uthscsa.edu) is a useful search engine that allows direct searches of external databases with a focus on clinical topics. Once the key words and databases have been identified, the next thing is to run the search. 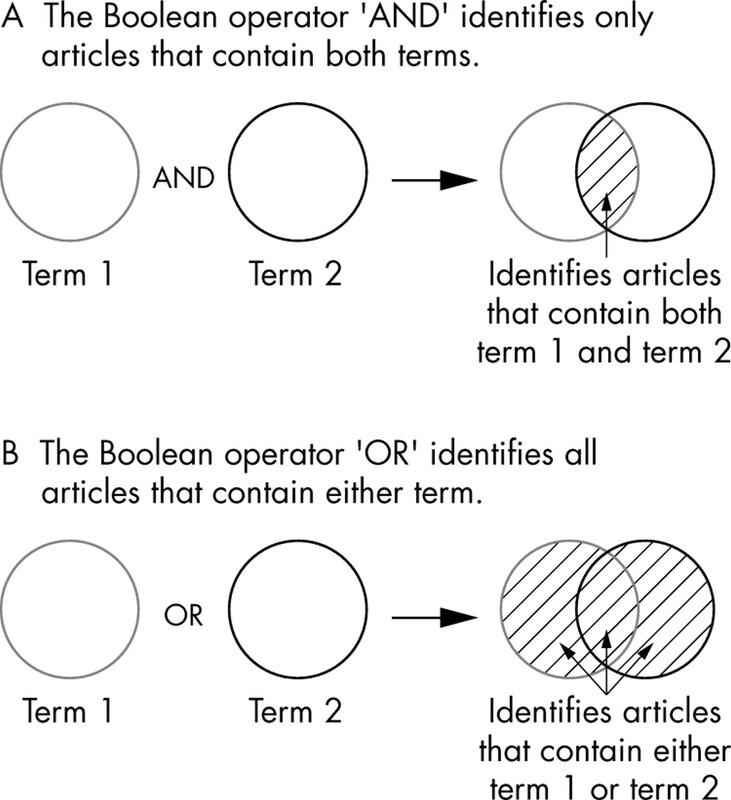 At the basic level, an efficient method is to combine individual words or terms using the Boolean operators “AND” and “OR”.11 If you are combining two terms, AND allows only articles containing both terms to be retrieved, while OR allows articles containing either term to be retrieved. A simple Venn diagram consisting of two overlapping circles may be used to illustrate this principle. In fig 2A, the two terms have been combined using AND, and in fig 2B, they are combined using OR. When too many articles come up after the initial search (which is often the case), PUBMED has a feature that allows you to limit the results of your search. You can limit your search by publication type (for example, randomised controlled trials or review articles); by date of publication; by language, by study population, and so on. PubMed also has a feature called “Clinical queries” which provides an easy to use approach to evidence based searching within the Medline database. “Clinical queries” is a preprogrammed research methodology filter that helps busy practitioners access the best available evidence by providing a quick access to reliable clinical studies related to therapy, diagnosis, aetiology, or prognosis. : (1) AND (2) AND (3). After you have obtained relevant articles on a subject, the next step is to appraise the evidence for its validity and clinical usefulness. Although there is a wealth of research articles available, the quality of these is variable. Putting unreliable evidence into practice could lead to harm being caused or limited resources being wasted. A detailed discussion of the critical appraisal of randomised controlled trials and systematic reviews will be provided in the next two articles of the series. When we decide after critical appraisal that a piece of evidence is valid and important, we then have to decide whether that evidence can be applied to our individual patient or population. In deciding this we have to take into account the patient’s own personal values and circumstances. The evidence regarding both efficacy and risks should be fully discussed with the patient or parents, or both, in order to allow them to make an informed decision. This approach allows a “therapeutic alliance” to be formed with the patient and the parents and is consistent with the fundamental principle of EBM: the integration of good evidence with clinical expertise and patient values.15 The decision to apply evidence should also take account of costs and the availability of that particular treatment in your hospital or practice. A practical illustration of issues to consider before applying research evidence will be provided in the fourth article of the series. As we incorporate EBM into routine clinical practice, we need to evaluate our approach at frequent intervals and to decide whether we need to improve on any of the four steps discussed above. As Strauss and Sackett have suggested, we need to ask whether we are formulating answerable questions, finding good evidence quickly, effectively appraising the evidence, and integrating clinical expertise and patient’s values with the evidence in a way that leads to a rational, acceptable management strategy.15 Formal auditing of performance may be needed to show whether the EBM approach is improving patient care. EBM aims to improve quality of care through the integration of best research evidence with clinical expertise and patient’s and parents’ preferences. In this article, I have explained the five essential steps for practising EBM, which are: formulating answerable clinical questions; searching for evidence; making a critical appraisal; assessing the applicability of the evidence; and evaluating performance. The principles and critical appraisal of randomised controlled trials, systematic reviews, and meta-analyses, and a practical demonstration of the five step EBM model will be explored further in later articles in this series. Steves R, Hootman JM. Evidence-based medicine: what is it and how does it apply to athletic training? J Athl Train2004;39:83–7. Brownson RC, Baker EA, Leet TL,et al.Evidence based public Health. New York: Oxford University Press,2003. Gray GE, Pinson LA. Evidence-based medicine and psychiatric practice. Psychiatr Q2003;74:387–99. Sackett DL. Evidence-based medicine. Semin Perinatol1997;21:3–5. Levi M. Formulating clinical questions. In: McGovern DPB, Valori RM, Summerskill WSM, Levi M, eds. Key topics in evidence based medicine. Oxford; BIOS Scientific Publishers 2001. Carneiro AV. The correct formulation of clinical questions for the practice of evidence based medicine. Acta Med Port1998;11:745–8. Rosenberg WM, Sackett DL. On the need for evidence-based medicine. Therapie1996;51:212–7. Jordaan M, Jones R. Adoption of internet technology by UK postgraduate centres: a questionnaire survey. Health Libr Rev1999;16:166–73. Rosenberg WM, Deeks J, Lusher A,et al. Improving searching skills and evidence retrieval. J R Coll Physicians Lond1998;32:557–63. Craig JV, Smyth RL. The evidence-based manual for nurses. London: Churchill Livingstone,2002. Patel H, Platt R, Lozano JM,et al. Glucocorticoids for acute viral bronchiolitis in infants and young children. The Cochrane database of systematic reviews. 2004, issue 3. Rosenberg W, Donald A. Evidence based medicine: an approach to clinical problem-solving. BMJ1995;310:1122–6. Straus SE, Sackett DL. Using research findings in clinical practice. BMJ1998;317:339–42.